Ariel washing liquid with pre-treat cap gives you outstanding stain removal in the 1st wash. The innovative pre-treat cap, with its flexible fins and spreading surface, allows you to pre-treat, scrub and remove stains, and also to dose the detergent precisely. 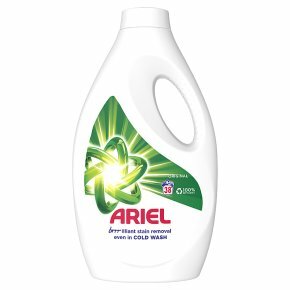 Although Ariel is incredibly tough on stains, it is very gentle on clothes. For perfectly clean laundry pour some liquid on a stain, spread and scrub with the pre-treat cap, and put your clothes in your washing machine. For best results, insert the cap filled with the detergent into your washing machine drum. Use together with Lenor fabric conditioners and Unstoppables for an extra boost of softness and freshness. 40 washes based on 50ml per wash. Outstanding stain removal in the 1st wash. Removes the stains that cause bad smells like sweat and body odours. Leaves clothes smelling extra fresh and clean. Brilliant cleaning on whites & colours even in a cold wash. Reduces the grip for dirt and for stains to set in. Ariel Original is also available in washing powder & pods. Ariel Original washing liquid gives you outstanding stain removal in the first wash. Although Ariel is tough on stains, it is very gentle on clothes . Unlike washing powder, Ariel washing liquid gets to work right at the heart of the wash. It removes the stains that cause bad smells like sweat and body odours, leaving your clothes looking and smelling brilliantly clean . For best results, insert the cap filled with the detergent into your washing machine drum. For an extra boost of freshness and softness, use together with Lenor fabric conditioners and Unstoppables. Ariel Original is also available in washing powder & pods. 38 washes based on 35ml per wash. Warning. Causes serious eye irritation. Keep out of reach of children. IF IN EYES: Rinse cautiously with water for several minutes. Remove contact lenses, if present and easy to do. Continue rinsing. If eye irritation persists: Get medical advice/attention. If eye irritation persists: Get medical advice/attention. IF SWALLOWED: Call a POISON CENTRE/doctor if you feel unwell. If medical advice is needed, have product container or label at hand.